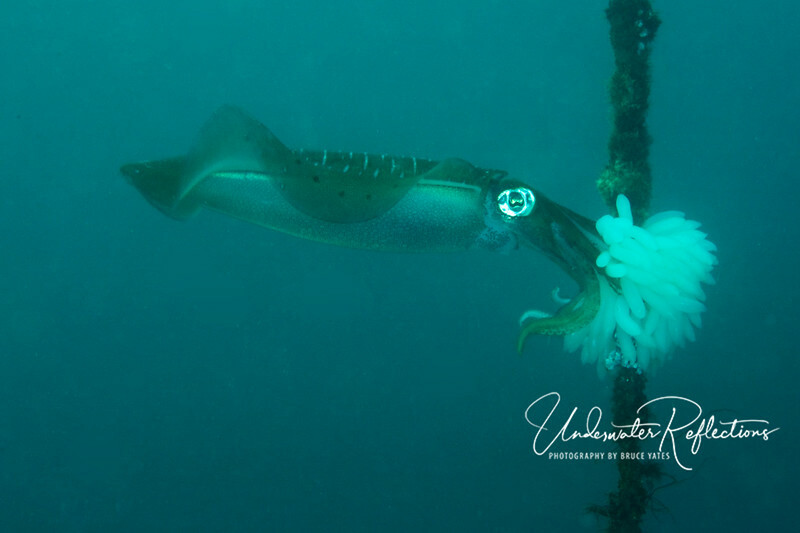 1-foot long female bigfin reef squid planting her egg casings - this was one of the highlights of the trip for me! I think squids are very cool, but have only seen a few small ones in all my time diving...and those always took off right away. This squid had clearly been laying eggs (the 4-inch white tubes hanging on the rope like bananas) on this mooring rope. She swam away as we approached, but after a few minutes came back. I spent the entire dive (1 hour) hovering at a depth of 40ft, and every 5-10 minutes she would return, add a few eggs to the bunch, and then (undoubtedly annoyed by my presence) take off again. Unfortunately, my only photos were from about 6-8 feet away (I was using a 100mm macro lens on that dive, so getting her entire body in the photo required being that far) and the water was murky. This was the best shot I got...not a technically great photograph, but enough to remind me of an amazing experience!